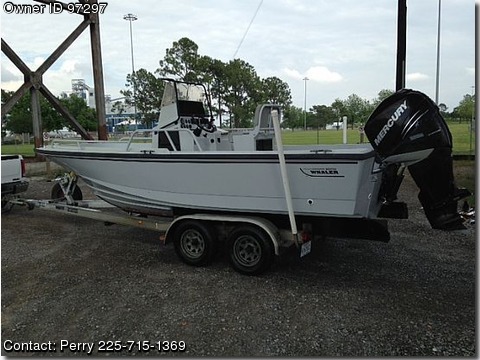 Please contact boat owner Perry at 225-715-1369. 20 ft Boston whaler OUTRAGE - 2000 year model 2008 Mercury Verado 250 hp 4 stroke Aluminum tandem axle trailer This is a classic well built Boston Whaler hull that is in Great shape. The hull is solid and come with two 6' long deck storage boxes, Front dry storage and anchor locker. The motor is a powerful 2008 Mercury 250 Verado 4 stoke with hydraulic steering. I just added a new SS 4 blade prop. It is priced below comparable Whaler models with this power. Great for coastal and offshore fishing. If you know whalers, you know it can take the seas and the short chop of the bays. 20 ft Boston whaler OUTRAGE - 2000 year model 2008 Mercury Verado 250 hp 4 stroke Aluminum tandem axle trailer This is a classic well built Boston Whaler hull that is in Great shape. At $23,500, it is priced below comparable Whaler models with this power. If you know whalers, you know it can take the seas and the short chop of the bays.